Curiosities: Is every snowflake unique? One fact we know from childhood: every snowflake is unique. Wang studies how snow and ice form into cirrus clouds — the high, gauzy clouds that play a major role in climate. 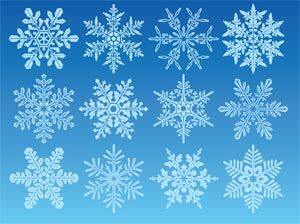 Snowflakes are all built on the hexagonal shape that occurs as water droplets freeze into crystals. The basic patterns include hexagonal plates, simple columns, thin columns, needles, and stellar, crystal or branched shapes. These shapes can build on each other to create complex, hybrid constructions that reflect the temperature and humidity conditions during formation. Warm, humid conditions are especially conducive to large, complex flakes.